The Sun Joe TJ603E is our pick for the best rototiller, which is powerful enough due to the 12-amp motor, is ETL approved, has an adjustment for 3 positions, has a long extension cord and has angled tines made of durable steel. Our step-up pick is the Mantis 4-Cycle Tiller and this one is a 4-cycle gasoline engine, so it is meant for commercial use. It has a speed of up to 240 rpm for the tine, has up to 10 inches of tilling, has a 25cc engine and has a Honda engine. 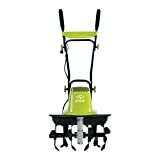 The budget pick is the Earthwise TC70025 Cultivator and this one is also electric, at 2.5 amps with a working depth of 6 inches. It is easy to lift and operate so it is great for most small homes and farms. It has 4 steel tines and an ergonomic handle. A rototiller is a mechanical tiller that can be used on the ground, specifically for farms. This kind of tilling machine is used by farmers, but can also be used by land owners depending on their preferences. The carabao or water buffalo is a primary farm animal in the Philippines for tilling. Instead of a manual one that is usually pulled by an animal, such as a horse, buffalo or water buffalo, these tilling machines are powered mostly by a gasoline engine to be pushed by the operator without a lot of effort. The rototiller is a farm machine is helpful for large areas of land. They are large enough to meet most demands by hectares of land that needs to be tilled. In lesser developed countries of the world, people use animals like the water buffalo or carabao (found in the Philippines) to till large tracts of land. However, this can be tiresome for most people because the carabao might not be as fast as a machine, exposing the operator to longer hours of sun in the process. Therefore, they will mostly need the help of a tilling machine. Most farmers stress the importance of tilling the soil. Tilling a land area or farm land is important to keep the soil healthy. Tilling is like combing a person’s hair – it allows the nutrients to flow properly so that your plants and crops will be much healthier when they grow. If you have a land area that is large, then managing it is already a big responsibility, which might require some investment and effort at hand. This is where a tilling machine might come in handy. Different kinds of soil need a different caring method. For instance, soils can be too acidic or too dry. You can refer to various online guides in order to help you find the best soil treatment for your needs. Simply tilling or plowing them is not enough, especially if your soil is not as bountiful or rich in minerals as others. Choosing between manual, gas powered and electric tilling machines can be tricky, and requires some budget consultation. For example, manual ones are budget friendly, but the catch is that they need a lot of work to pull through. Gas powered engines are the best way to go for power, especially for a large area of land, but can still be a hassle for its fuel to oil ratio mixing. Electric ones do not have this hassle, but can be more expensive in the process. Engine: most rototillers will come at a 4-cycle engine to be more powerful, but some lesser expensive ones are at 2-cycle only. 4-cycle ones run on specific oils and cannot be mixed with 2-cycle oils. 4-cycle ones are more expensive but are easier to start due to their unique composition or mechanism, as opposed to that of the 2-cycle engine. Power source: most powerful rototillers will be gas powered, but there are also ones that are corded electric for less noise and convenience. The gas powered ones are ideal for commercial use because they are less expensive and usually more powerful, but can be quite noisy and a hassle to start. Electric ones, on the other hand, are easier to start and quieter to operate, but are more expensive. Ideal use: you should know whether the rototiller will be used for commercial purposes or for a home farm land. Commercial ones are usually larger and can go for larger areas of land, and are usually gas powered and can be a bit noisier. For residential purposes, you can just get one that is of less power and price than a commercial one, and one that is quieter in operation. Size: the size of the rototiller is usually from 11 to 16 inches on the average, and refers to how much it can cultivate. Bigger ones are ideal for larger farm lands. A larger one can also potentially save more time in the process, but may consume more fuel or electricity, making it just a little more expensive in one way. Therefore, you should match the size of your farm land with the machine you have in mind. Amps: the amps usually refer to the electric powered rototillers, which can vary between 6 to 12 amps of power. A better amperage means that it has a greater power, and is fit for those areas of land that can go up to hectares in scale. You have to pick one that has more amps if you need more power in your hands. Fuel capacity: for the gas powered rototillers, this refers to the fuel capacity in cc, which can vary between 43cc up to 99cc on the average. A larger fuel capacity can save you more time in the long run. It can cost you more, however, for the fuel, but if you do need more power and time in your hands without the need for refueling, you should definitely consider a higher capacity for fuel. Ease of starting: any rototiller, or farm equipment for that matter, should be equipped with an easy start mechanism. Gas models are usually harder to start than electric ones, but there are also 4-cycle engines that can be started much easier than regular 2-cycle engines. Starting any engine easily is important because it reduces wasted time at hand. Ease of gripping: the handles on the rototiller should be easy to hold. To prevent user fatigue from getting in your way and ruining your work, you should consider one that has easy to grip and usually rubberized or has indentations for your fingers to easily grip it properly. This is usually meant for safety purposes while you are out in the field. Good weight balance: the rototiller should have a good weight so it is not too heavy and not too light. The weight should not be too much, so that it will be easy to handle. However, something that is too light might be a hassle to handle because of the lack of balance overall. Durability of the parts: you have to consider a rototiller that has durable parts that don’t easily go haywire in any field work for years of use. Durability is also greatly important if you want to use the tilling machine for field work commercially, and especially for larger areas of land or farm. The Sun Joe TJ603E is our top pick for the best rototiller, which has handle that easily folds for convenient storage so that it will be easier to store whenever you don’t need it anymore. This fact also helps you to handle it carefully without feeling awkward. There is also a 3-position wheel adjustment so that you can maneuver it with great ease. The maximum extension cord length is up to 100 feet so you can definitely move around the farm with it, without much hassle. Also, it has rear wheels that definitely make it easy to maneuver all around. It has a max width for cultivating of 16 inches (40.6 cm) while the max cultivating depth is 8 inches (20.3 cm) deep. The size is a good choice for medium to large sizes of land, so that you can prepare the seedbed for planting in no time. It can pierce through the soil at 340 rpm with its powerful 12-amp motor. Moreover, it has a decent weight of 27.1 lbs. 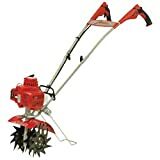 Equipped with 6 durable steel angled tines or tilling blades for maximum durability. Since it is electric, it has no gas, oil or tune-ups. Moreover, it is ETL approved for safety and it has a 2-year warranty. The only con but not a deal breaker with the Sun Joe TJ603E is that it is not a variable speed one, but it is still electric powered and powerful, nonetheless. The Mantis 4-Cycle Tiller is our step-up pick, which is easy to control the speed because of the finger controlled throttle, so that you can achieve ease of operation and a simple usage. For the size, it has a 9 inch width so that you can go around smaller spaces in your farm as compared to larger sized tilling machines. The engine is a Honda 4-cycle, so it is powerful as a gas engine, but with no fuel mix required. The engine’s capacity is at 25cc and you get twice speed compared to other tillers while it weighs just 24 pounds for added ergonomics. The tine speed can up to 240 rpm for more work done in the process. It has tines with a curvy shape, and all of them can dig up to 10 inches deep. You can also do a shallow cultivating method on the other side for 2 to 3 inches of soil tilled. There is also a kickstand for the rototiller so you can rest it without falling over when not in use. It is also portable and folds so that you can store it in your garage or shed. The unit has a backup of 5 year warranty and a lifetime warranty on tine breakage. The Earthwise TC70025 Cultivator is our budget pick for a rototiller, which is equipped with 4 strong steel tines, which are ideal for most regular sized, small to medium areas of land at home or in your backyard. It can give you precise tilling due to the simple shape of the tines, which can be ideal for toughest yard projects. It has a width of 7.5 inches and a 6-inch working depth for when you go through the deepest part of the soil. The powerful 2.5 amp engine is electric so you do not have to worry about mixing gas to oil ratios. It is also sufficiently lightweight at only 8.8 lbs, that even older folks can handle it. Also, it is worth noting that the soft ergonomic grips can help you to handle it with great ease. As a comfortable tiling machine, it does not give you user fatigue like others do. Being a lightweight and easy to operate tilling machine, it is portable in its design and convenient to store due to the construction, which only depends on a 40 volt lithium ion battery as an electric unit. It is backed by a 2 year warranty. the Earthquake MC43 Mini is a good gas powered unit that is quite stable due to the less bouncing and jumping with the included overhand control. This makes it easier for you to handle the unit even in uneven ground and bad weather conditions. What’s more, the adjustable on-board wheels make the mobility very good, even when you are really tired from an all-day work at the farm or field. As for the engine, it has a capacity of 43cc, which is pretty big for a gasoline engine. It works well without damaging your plants due to the safety features included. As a gas type, it only uses a 50:1 gasoline and oil mix ratio, which is standard for most 2-cycle engines. It has a depth of 8 inches and a tilling width of 10 inches maximum and 6 inches minimum, so it is pretty good for its size. Accommodating and adopting to various types of pre-tilled soil, this rototiller runs on a gear drive transmission, like most 2-cycle engines out there. It is easy to do mixing on this tilling machine, and can be a breeze to perform weeding or aerating with, in your chosen land area. The tiller and engine is backed by a 5 year warranty as well. The Mantis 7924 2-Cycle may be a 2-cycle engine but it is great for commercial use. It has a couple of sharp tines that can easily dig down to 10 inches in depth. Because of the unlimited speed choice due to the fingertip throttle control, the rototiller is easy to handle this unit depending on the speed that you want. Moreover, you can be able to weed 2 to 3 inches deep with its tines. Being an easy to put together unit due to the ease of instructions, you can also do aeration with it, if you include the optional attachments. It is proven to have at least 75% easier starts due to the fast start technology built in within the rototiller. Also, the folding handles make the unit very easy to store whenever no longer needed. It can get between plants without ruining them, and can have the ease of rototilling and digging whenever possible due to the design. Moreover, the comfortable sure-grip handles can help prevent user fatigue altogether. And because it weighs only 21 pounds, it has a good weight that will not keep you stressed when under the sun. The unit is also 9 inches wide for digging and weeding, which is sufficient for a tilling machine that can go along fences without as much ruining other plants. It has a 21.2cc capacity as a 2-cycle commercial engine as well, so it is decent on its fuel capacity. The Trimmer Plus GC720is a great choice for a cultivator for small gardens and lawn areas. It is a unit that uses a total of 4 steel tines that also include 8 blades. These parts can help you to prepare a small garden bed and anything else in between. It is also attachment-friendly, as it easily connects to attachment-capable trimmers. If you have anything that’s made by Remington, Craftsman or Troy-Bilt, it can be compatible with this unit. The tilling machine also comes with an adjustable tilling width up to 9 inches so that you can adjust accordingly depending on your land area, without as much damaging other plants around. To keep your other garden or farm items safe, and to keep your engine and tines in a clean state, the rototiller has a poly guard keeps the dirt and dust off. As a small garden cultivator, it is backed by a 2-year limited warranty. The Southland SRTT196E Rear is great for those who need something with pneumatic tires to move around their large area of land. It has a 196cc engine and is also a 4-cycle engine so that it will not be a nuisance to start, as compared to those that are 2-cycle engines. The rototiller has a 18-inch tilling width so it can be great for those with larger areas of land. Its power is at 9.6 foot-pounds on its OHV engine, so it is definitely a must-have for those who either want to go for a commercial power or heavy duty power. To help you to move it from one place to another easily, it is equipped with 13-inch heavy duty pneumatic tires. Moreover, the rototiller even has counter rotating tines that are self-sharpening for less maintenance hassle. As for the depth, it has a 10-inch tilling depth. For ease of controlling, it has a forward and reverse gear drive system so you can drive it anywhere in your land area without too much hassle. If you want a cordless tiling machine that is electric powered, the Greenworks 10-Inch 40V can be a great choice. The rototiller has an adjustable tilling width of 8.25 inches to 10 inches so it is very wide as compared to others, and can be adaptable even to medium to large sized land areas. In addition to that, its 4 adjustable forward rotating tines are durably made. For the power source, the rototiller uses a g-max 40v lithium-ion battery which has no memory loss after charging to avoid accidental discharging and better storage options. With an easy start 2-step switch, you don’t have to suffer the inconvenience of a gas engine with this kind of cordless unit, due to being an electric unit. It is also easy to move around with the large 6-inch rear wheels. As a good yard work solution without the hassle of gas and oil mixing, it is electric so it has no hassle of spilling gas. The rototiller will definitely fit battery models 29462 and 29472 as a unit, if you have any of those batteries. 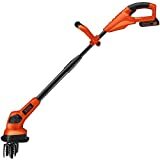 The BLACK+DECKER LGC120 20V is a great choice if you want to control the weeds in your garden or farm. The dual tines that are also counter-oscillating can help you to achieve the tilling experience without ruining your other garden or farm plants. You can use the rototiller for most landscape beds and weeding activity safely with lesser maintenance as compared to other units. Because it is coupled with an energy star-qualified charger and battery, which is a 20-volt max lithium-ion battery, maintaining its charge is a breeze, since lithium ion does not have the memory effect problem, which means it will hold a charge longer. In addition to that, it only weighs 8.1 pounds so it is great even for smaller people who can’t lift large items. As for the capacity in power, the rototiller can cover up to 325 square feet per charge of the battery. And in addition to that, the lightweight upright design can really help those who can’t really drag heavier machines. It can be used for most tasks of cultivating garden beds in any farm or garden, and is backed by a 2-year limited warranty. If you want something that is ideal for heavy duty use, you can try the YARDMAX YT4565 Dual, in which the self-sharpening tines measure 13 inches so it can reach deeper into the ground for better tilling action. Moreover, it also measures 13 inches on its pneumatic wheels so it can go around even larger heaps of land without compromising on speed and power. Added to that, the wide rear tine design for the tines measures 18 inches so it can be able to till more in less time. The rototiller also has a 190 rpm rotational speed, allowing you to work faster in less time. It also has a chain gear transmission and a total of 2 speeds for forward and reverse, so you can customize your work routine on the field with less hassle. With a fairly powerful capacity of 208cc for its engine, you also get 7 depth adjustments for the tines for better tilling depth. There are also a total of 10 tiller and 2 hammer tines present in the rototiller, with a 6.5-inch working depth. 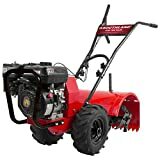 Allowing for a single hand operation due to its easy design, it has a 9.50 ft-lbs gross torque for its Briggs & Stratton engine, so it’s quite powerful. It has a 2-year residential and a 90-day commercial warranty. Other rototillers did not make it to our list because they were not powerful enough, and they also did not have durable parts. Most of them were also not easy to move due to being too heavy to lift. Q: What are the steps you need to do in order to start a garden? Gardening is a great hobby. Find a good gardening or farming spot. Make sure that your spot has a good amount of sunlight to avoid your plants getting less nutrients. Look for a good soil. Alternatively, if your soil is not that healthy or nutrient packed, you can try fertilizers that are natural to add more nutrients to it. Learn from experience when managing pests. There are some wild animals that can’t really be kept out no matter how much you trap them, so learn their behavior instead. Organize the garden’s layout. You should keep plants well-organized not just randomly put them anywhere. You have to make a plan on different spots so they don’t look clumped together. Buy the appropriate seeds and seedlings. This one will be your entire decision, as you should decide on what plants you want to grow on your garden or mini-farm. Get help from friends and family. If you have someone in the household or in your officemates who has a green thumb, you may be able to get some tips from them. Get the right garden supplies. Consider gardening tools like shovels, hoes, trowels and even a tiller. You can check out these tools on most hardware store and buy the appropriate ones. Q: How do you maintain a good farm or garden shed and keep it organized? Safety first in all tools Don’t leave them lying around when they are not in use to avoid accidents. Consider the space constraints If you have tillers and cultivators around that might be too big for your shed, you should probably upgrade your shed. Protection against theft If you have an electric garden tiller that’s quite pricey, you need to store it in a locked shed. Maintain your shed properly A poorly maintained shed can possibly corrode any electric motor garden tool, so you should clean it properly. Organize your tools If you have garden tillers and cultivators then you should organize them properly to avoid damaging other garden tools. Q: Aside from the rototiller, what else are some important gardening tools? Q: Why is good soil or the type of soil important to consider in farming and gardening? A: Soil composition is an important aspect of gardening. This is because soil types can vary between regions and can potentially affect the growth of your crops and plants. They are usually differentiated by their pH levels and this also means that they can be tested and improved. Soil composition is important to know about. Most soil types can either be too acidic, too alkaline or in the middle. This is why you need to test the soil or know its composition first before you plant your seeds or seedlings in order not to waste your plants in the process. Q: Is it worth it to start planting a straw bale garden or farm? Good adaptability It can adapt to almost any soil type due to its molecular composition. Water retention Strawberry bale keeps water for days due to their sponge like effect. Less maintenance Most straw bales don’t really need a lot of upkeep due to less compost needed. Extended growing period They mostly generate heat so they can use it in the cold months of autumn or early spring to survive. Less waste products Growing a straw bale garden or farm uses little to no waste due to the recyclability of the end product. Q: What are the uses and benefits of a rototiller? They are quicker than manual spade digging or hoeing. It can be used to clear out pathways. You can control weeds better with them. They can be used to till, aerate or loosen the soil. They’re not just for large farms – even home gardens can use them. Q: Are there cons or dangers of using a rototiller? It might make the soil more compact or end up with a ruined structure. Tilling might cause more weeds to grow due to the distribution of moisture. Soil erosion and bare soil problems can happen if you till the soil too much. It might delay your planting season, so make sure you time your tilling. Q: What safety precautions should you consider when using a rototiller? Eye and ear protection Garden tillers might spray out soil, so you need eye goggles and ear protection from engine noise. Safety shoes and pants Even most electric rototillers can spray out debris, so make sure you wear safety gear. Wide open space Only use the rototiller in a wide open space to avoid the likelihood of hitting any object or entity. Know your utility lines You can till anywhere but don’t go over your utility lines like your plumbing pipes or power cables. Refuel when cooled down Any tiller cultivator might get its engine ruined if you refuel it when it’s still hot. Turn off before maintenance Make sure your tiller and cultivator is plugged off when you’re cleaning it. Turn off when not in use Whether you have a gas or electric tiller, it should be turned off when not in use to avoid accidents. Read the user’s manual The tiller’s user manual might have some tips on how to prevent accidents and to use the tiller properly. Q: Which is better: gas powered or electric powered garden or farming tools? Noise levels Gas powered ones are usually very noisy in nature. Electric powered ones tend to be quieter. Power They tend to be on the powerful side, usually for heavy duty purposes. Most are powerful, but may not match the power of a true gas engine. Maintenance and starting Gas engines can be a hassle to maintain, to start and to mix gasoline and oil in the right proportions. Electric powered ones have a quick starting feature and are less of a maintenance. Variants Gas powered ones can either be 2-cycle or 4-cycle on their engine composition. Electric powered ones can either be corded or cordless in their internal composition. Cost Gas powered ones tend to be cheaper so they are mostly ideal for commercial purposes. Electric powered ones do cost more than gas powered ones. Ideal use Gas powered machines are ideal for commercial and for heavy duty use. Most electric powered ones can be found in home or residential uses. Q: How are 2-cycle and 4-cycle engines different? 2-cycle: these ones create combustion using only 2 strokes, and thus they are also known as a 2-stroke engine. They need a unique oil that is only tailored for them, and not for the 4-stroke engine, which is usually a thinner oil. 2-cycle engines need a fuel to oil mix ratio depending on your engine type. Most people don’t like 2-stroke or 2-cycle engines because they can be a hassle to start and to mix. 4-cycle: these ones create combustion using a total of 4 strokes, and thus they are also known as a 4-stroke engine. They are easier to start and to maintain, but can be pricier at most. They are also preferred by those who don’t want the mess of having to mix oil and gasoline, which can be a hassle for most people. 2-stroke oil cannot be used on 4-cycle engines due to incompatibility with the thinness of the oil used. Q: Is it safe to use 2-cycle oil in 4-cycle engines? Choosing the right engine oil is important for safety. A: As we mentioned above, 2-cycle oil and 4-cycle oil cannot be used on the opposite machine or engine because of oil incompatibility. For instance, 2-cycle oil is thinner because it has more additives, which can be dangerous to the 4-cycle engine. This is why you should know first if your gasoline engine is a 2-stroke or a 4-stroke before you buy the appropriate oil. In fact, most 4-cycle engines don’t need to pre-mix oil and gasoline, anyway. Soil type can vary between regions. Clay Clay type soils get very hard when dry and sticky when wet. They are ideal for plant growth due to the pack of nutrients it holds, but it must be properly drained and maintained regularly. Sandy Sandy soil can be easy to drain, but may also lack nutrients that most plants need. It is a great starter for beginners because it is easy to cultivate, since it can easily warm in the spring. However, it is also easy to dry out. Peaty Peaty soil is great for superb plant growth, if coupled with fertilizers, and has a darker color than most soil types. It is mostly made with organic matter that makes it a very acidic soil to have. Silty Silty soil can be easily drained and compacted, but can be weak in its structure. It is, however, good in moisture retention and is quite fertile overall, when you manage it properly. It has a soapy and smooth feel when you hold it in your hands. Chalky This is a very alkaline soil that has a stone-like feel due to the presence of limestone bedrock. You can improve chalky soil with the use of fertilizers to keep minerals close to the plants. It is, however, good to drain. Loamy Loamy soil is probably the best kind of soil that there is, as it is the easiest in cultivation, moisture retention, draining, structure, nutrients and spring warming. It is also an extremely rare type of soil. Q: How do I test my soil quality? Try nursery kits with DIY pH testers. These ones are cheap and will just give you the information on the pH level of your soil, whether it is acidic or alkaline in nature. Consult a soil lab test and prepare your sample as instructed. Most soil labs will require you to have 4 to 6 inches of soil layers, from 6 to 8 samples, each in a plastic bag. Q: How are tilling and aerating different from each other? Tilling – this method is used to keep the soil loose enough so that when you plant, the soil becomes more attached to the plant to give it sufficient nutrients. Aerating – also known as cultivating, it is mostly done to give oxygen to plants while they are planted, and also to remove potential weeds in the garden. Q: What is shallow dry tillage and what are the methods to do it? A: Shallow dry tillage is a technique used in large farms in most tropical countries like the Philippines. It is a process that is done usually in the rainy season or right after harvesting any crops. This technique makes the soil more moist so that it can be cultivated properly. Q: Speaking of farms, what’s the best farm to check out in the Philippines? A: The San Benito Farm, located in Batangas, Philippines, is very famous for being near beaches and being more close to nature than any other. It is complete with many amenities, vegetation, garden landscapes and even a resort. It is more than just a farm – it can be a great vacation spot, as it has a very relaxing ambiance for people. Q: For those in the U.S., where’s the best place to enjoy fresh farm produce? Lake Champlain is known for its Harvest Festival for farmers. A: If you live in the United States, you’d have to check out Lake Champlain at Crown Point, which is known for a unique Harvest Festival and Country Fair. In this event, you can shop for amazing finds, farmer’s markets, great food and beautiful sceneries. If you want to get inspired on starting your own farm, this is a good place to go to. Q: In South Africa, where can I find a good farm to visit? A: A famous farm would be the big pineapple farm, with the trademark giant pineapple, located in Bathurst in Port Alfred, South Africa. If you are inspired to establish your own pineapple farm at home, this can be a great inspiration for you. Additionally, Bathurst also has many other amenities in the town, such as art galleries, pubs and the like. Q: Are there great farms to visit in Norway? A: Not exactly a farm, but they do have Iron Age Farm, located in Stavanger, which can help children and adults learn about the age old tools that were used back in 650 A.D., so it is like a time traveling experience for them. It might be a replica, but the place is very scenic and a nostalgic place for those who truly enjoy history and the use of manual tools back in the days. Q: Which dog breeds can possibly help me in the farm? Cane Corso – this Italian breed is a working dog that was originally used for both farming and hunting. They have a confident attitude, and they are also best with children and other dogs. Soft-coated Wheaten Terrier – this terrier breed is great for older children, due to some stubbornness, but when well-trained, they can be great workers in your farm. They are great guardians for any property and are usually cheerful and friendly. Overall, the Sun Joe TJ603E is our pick for the best rototiller due to the 3-position adjustment, quality steel tines that are angled, and powerful 12-amp motor, which can help speed up work in your garden or farm yard.